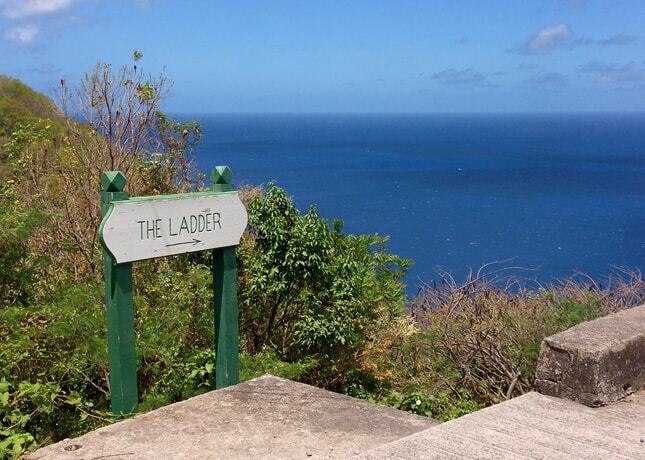 I had never heard of Saba before E forwarded me a travel article presenting the island as a diver’s paradise. We had been looking for a sunny and warm vacation destination, but we only had 9 days off, so we could only go so far. We wanted an active and exploratory trip, not a crowded and isolated all-inclusive. 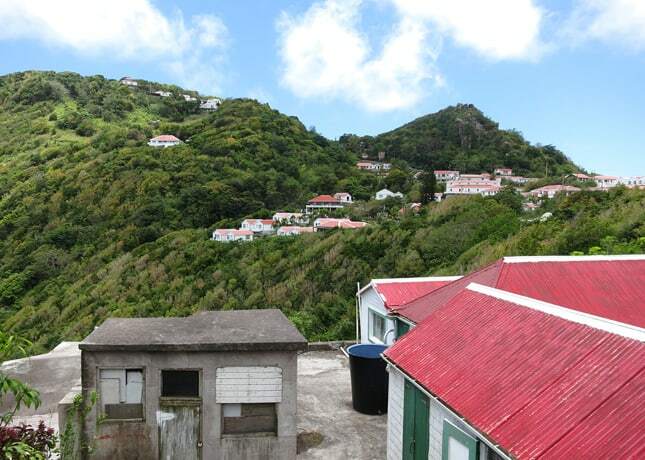 As I read more about Saba, I became increasingly intrigued by it, and before long, we had booked our vacation. Saba is a small 5 sq. 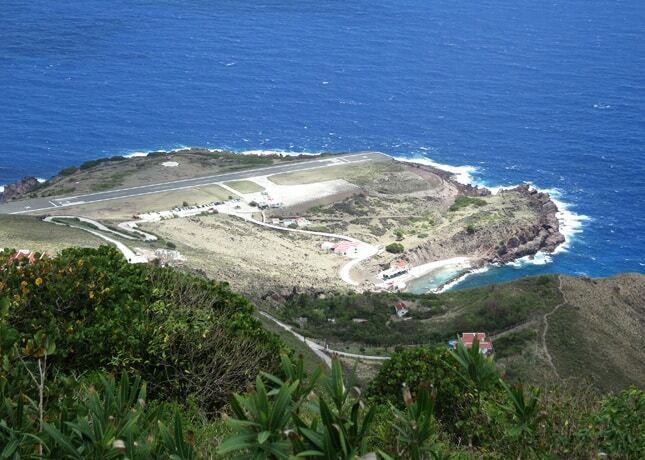 miles island, part of the Netherlands Antilles, just off St. Maarten. 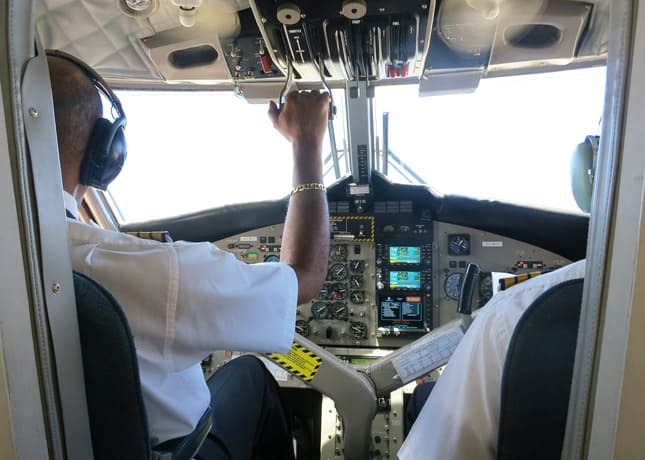 To reach it, we had to fly to St. Maarten, then transfer to a small 18-place plane that flew over to Saba in less than 15 minutes. We landed on the infamous 1,300-feet “shortest runway in the world” which only looks intimidating – the plane landed softly like a fly. No closed cabin for these pilots. The airport peninsula and its short runway. 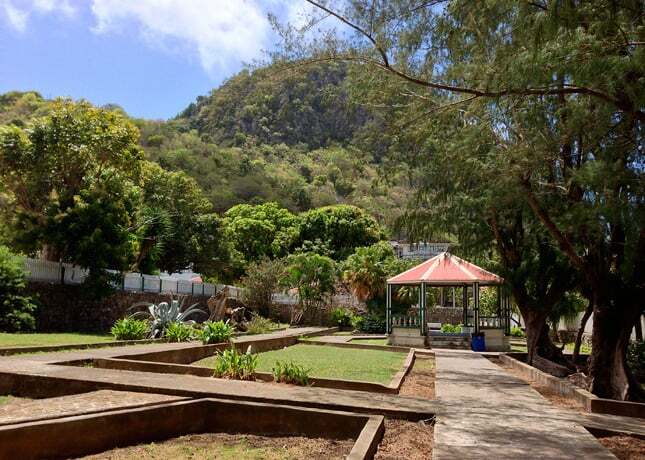 What makes Saba so special? 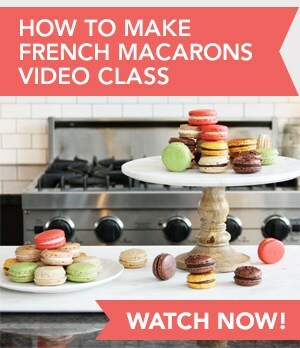 The most obvious answer is this one: there’s no beach. Well, there’s one, a small patch of sea-level ground at Wells Bay that gets covered with fine, black volcanic sand in the spring when the currents and tides are right, but Donna, our island guide, told us that the beach hadn’t shown up for the last three years (they were crossing fingers it would this year). The idea that you’re in the Caribbean without easy access to the sea needs a little getting used to; it automatically filters out the traveler that’s more interested in sun bathing, swimming in the sea and relaxing, rather than being active and exploring. Since the latter was exactly what we were looking for, we immediately felt right at home. 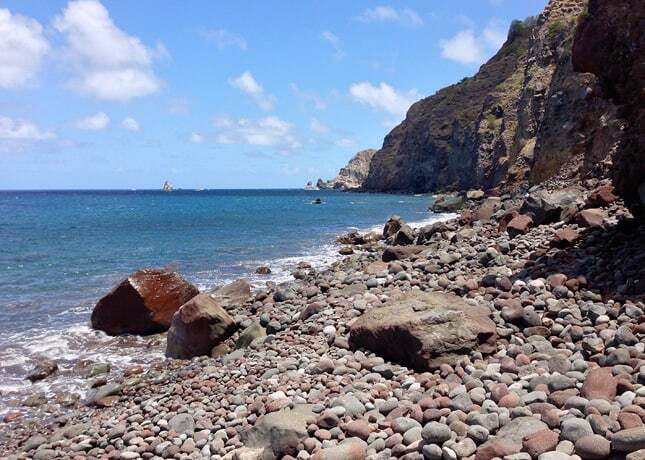 Saba is a rocky, volcanic island on which you always have to climb up or go down a hill. The road that crosses the island is tortuous and often steep, and our first drive, in the taxi leading us to our hotel, was impressive, to say the least. 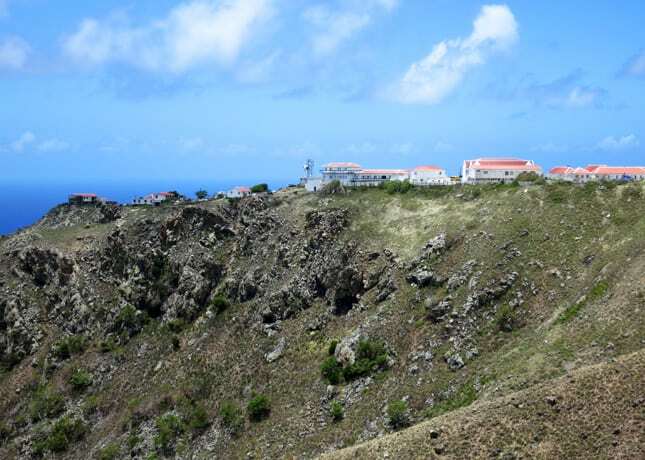 It was a great way to get acquainted as we had a peek at some of the island’s landmarks: the houses perched on the island’s cliffs, the entrance to the hiking path leading to the island’s dormant volcano peak and highest point (Mt. 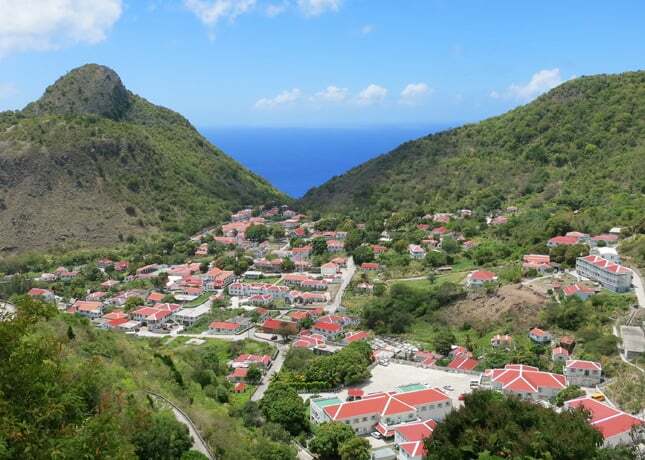 Scenery at 2,850 feet), the delightful restaurants lining the main street of the village of Windwardside, and finally, the scenic drive down to The Bottom, the island’s capital. 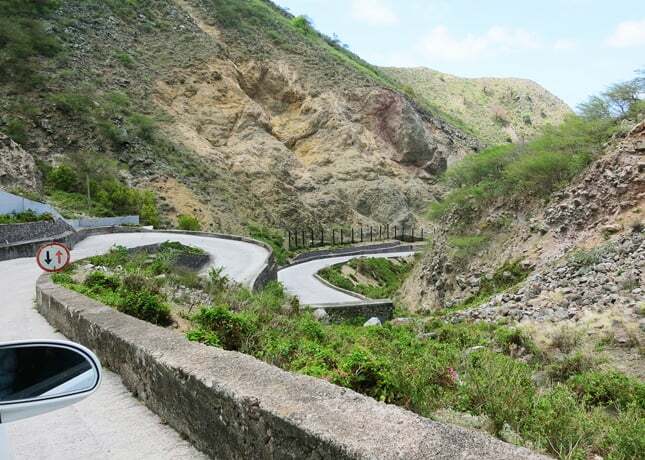 A twisting and turning part of “The Road”, Saba’s main road that crosses the island. Proof that everything’s perched in Saba: even the elementary school sit at the top of a very steep cliff. 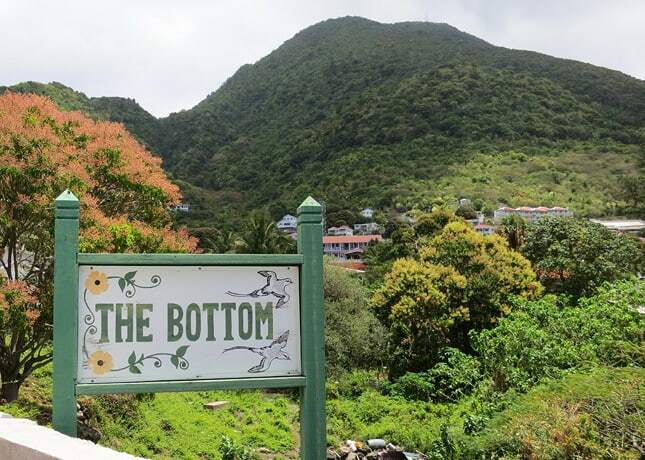 Names given to geographical locations in Saba are very litteral: The capital is aptly named “The Bottom” for its geographical location in a valley, surrounded by several hills. 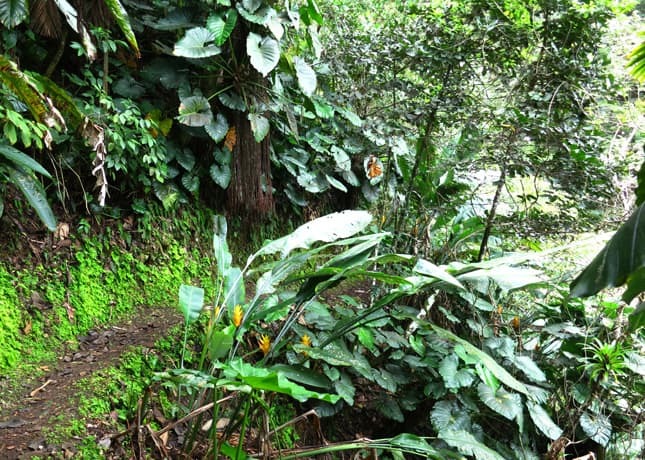 What attracts many travelers to Saba is its incredible biodiversity: within minutes, you can drive (or walk) from dry and rocky cliffs to humid and lush rain forest. 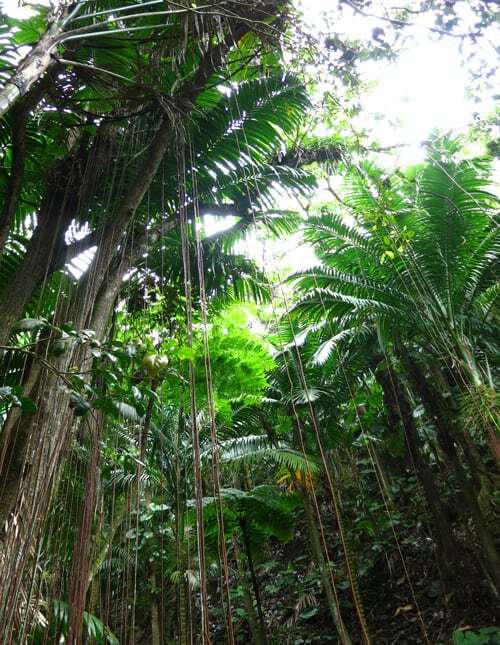 The island is blessed with an incredible network of well-maintained hiking paths, one of the island’s major attractions. These paths used to be the “roads” followed by farmers to reach the land where they cultivated vegetables and fruits, which needed the high-altitude humidity to grow. 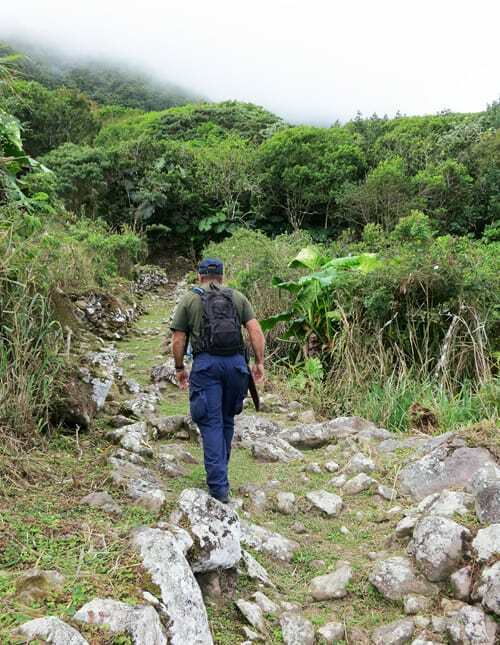 A week to explore all of Saba’s trails isn’t enough, so we had to make tough choices. 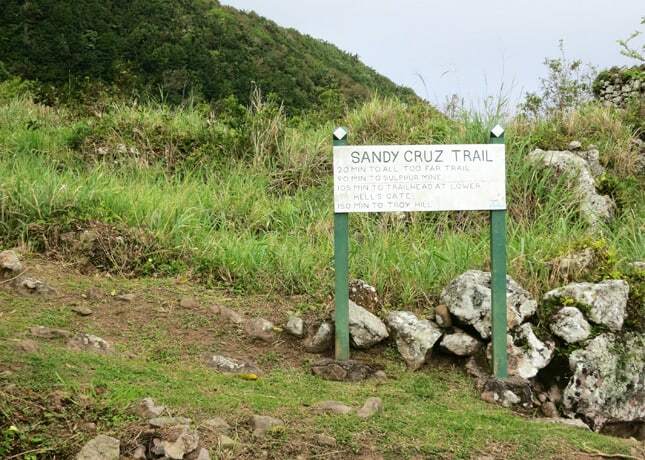 Many people recommended the Sandy Cruz Trail, and it was a great discovery hike indeed. “Jungle James”, a very knowledgeable nature guide, and his enthusiastic apprentice accompanied us and fed us loads of information about this incredible ecosystem, which was completely new to us. We even tasted different plants and fruits along the way (something we would have never dared doing by ourselves!) As we walked back down towards The Bottom, we witnessed the vegetation quickly changing from primary to secondary rainforest, to broadleaf woodland. At the start of the trail, we were walking in the clouds. Another “hike” I did on my own (while E was diving) was going down and back up The Ladder, a 800-step path that connects Ladder Bay to The Bottom. The views coming down this path are breathtaking and reaching the sea at the end makes the trip worthwhile. 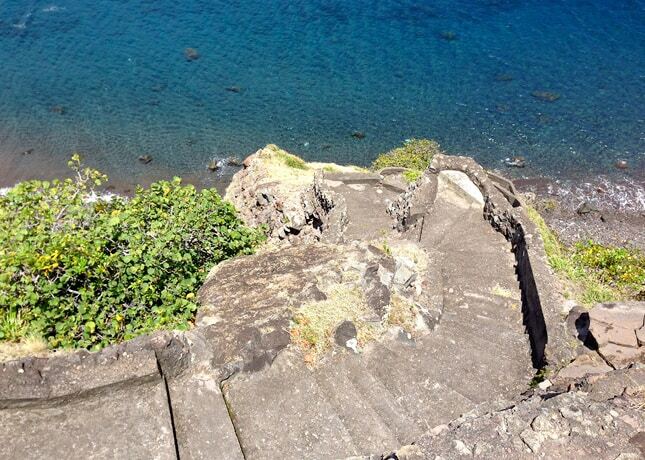 What’s completely mind-boggling is that up until the late 20th century, this was the only access to the island. This means that everything that was brought to the island (materials to build roads and houses, furniture, etc.) 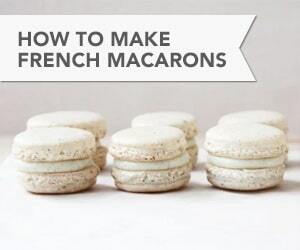 was carried by hand using these steps. As I made my way back up the hard climb, stopping every 50 steps in the shade to catch my breath and drink a little water, I realized just how much the world had changed. Who, today, would repeatedly carry 100 to 200 lbs charges on their heads up 800 steps for the sake of building a settlement? I feel like it speaks volume about Saba’s people and their determination. The “beach” at Ladder Bay is formed by huge volanic boulders which roll around easily as you step on them — now is not the time to twist an ankle! 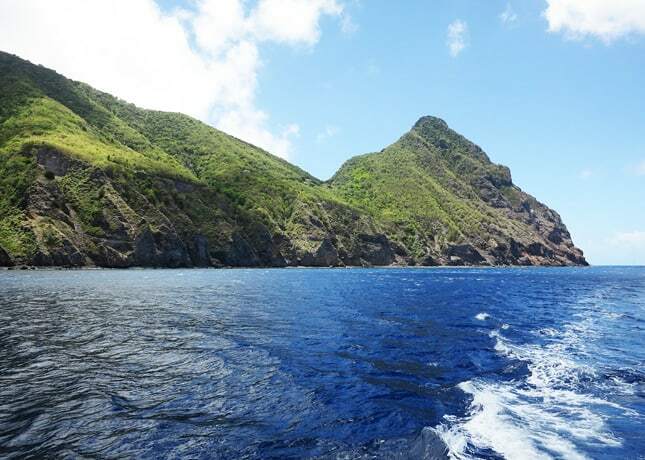 As I mentioned before, Saba is also a prime scuba diving destination, and it probably is the island’s primary tourism draw. 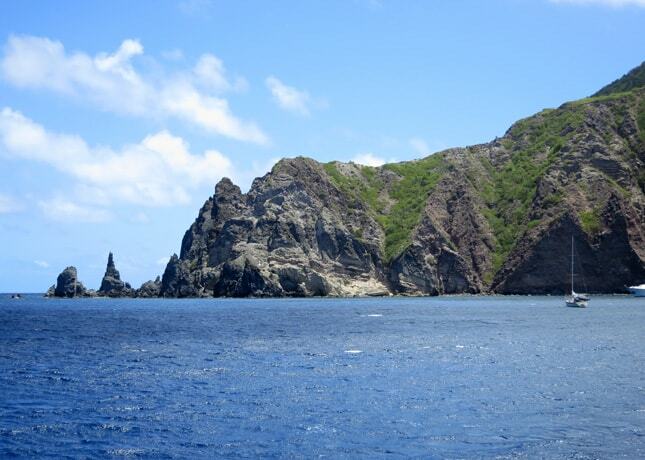 Due to its volcanic nature, Saba is completely surrounded by a protected marine park spanning over 1,300 hectares. 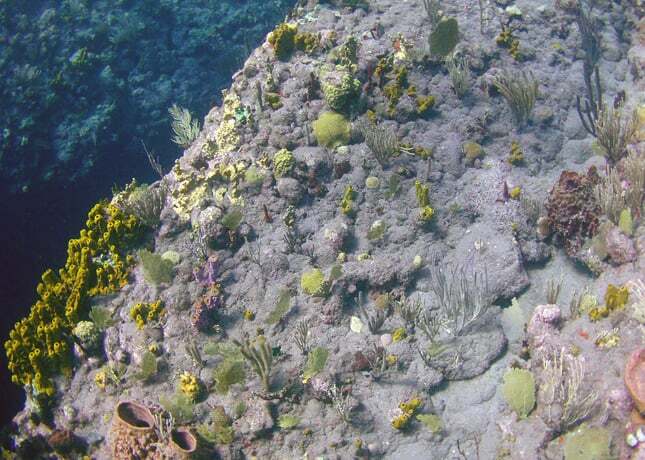 Dozens of dive sites are located within minutes of the shore, offering unique sights such as underwater cliffs, pinnacles, and an incredibly rich coral life. E went on several dives and, as always, I was able to benefit from his efforts, thanks to his HD-filming diving mask. He told me the range of colors and types of corals he saw was unlike anything he had ever seen before – and indeed, none of his previous diving films showed as much detail and life as Saba’s underwater landscapes did. 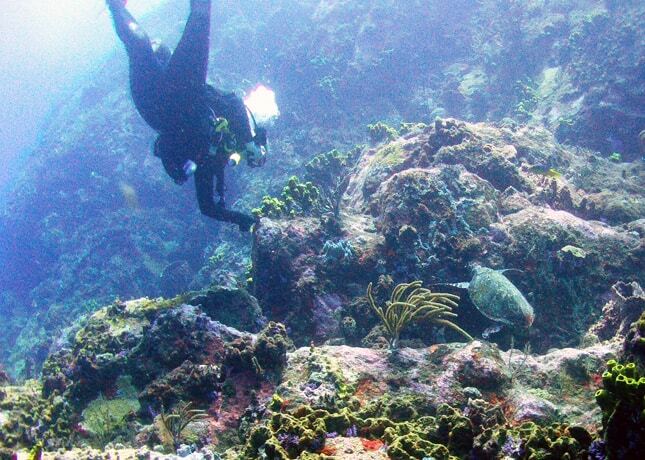 He saw turtles, barracudas and sharks as well as hundreds of fish and coral species. Sometimes he swam along cliffs from which he peeked at a seemingly bottomless sea; sometimes he let himself being cradled with the fish and the intricate plant life by the soft currents. 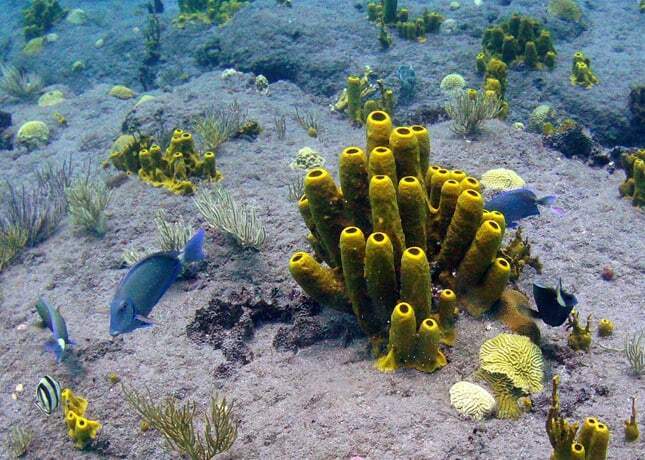 No wonder Saba is frequently listed among the world’s top diving destinations – it may be the Caribbean’s very best spot. 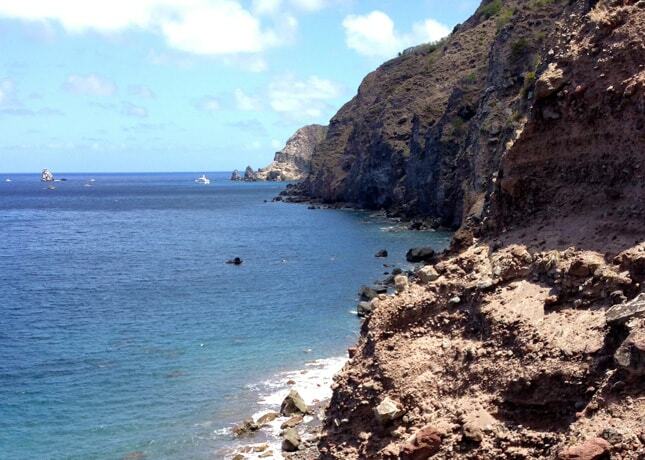 Saba’s underwater landscapes include cliffs dotted with hundreds of different coral varieties. We had a refreshingly fulfilling and relaxing time on Saba. 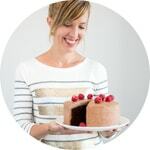 It’s impossible to feel stressed over there; to go from point A to point B, you simply walk, call a cab, or do as the local do and hitchhike. Criminality on Saba is very rare; everybody knows everybody. Someone told me that getting to know everyone on Saba takes about a month, but from day one, you’ll find yourself saying hello to all those you meet. We left promising ourselves we’d go back so we’d find that peace of mind again, the one we reached after only a few days on the island. We’ll go back to keep on diving, hiking, and eating our way around the island.